Civil wars, such as in Syria/ Iraq, Afghanistan, South Sudan or in Donbass persist, as does forced migration as an effect of violent conflicts around the world. Researchers of the peace and conflict research institute BICC (Bonn International Center for Conversion) conduct empirical research and provide advice on the ground in these areas of conflict. The BICC Annual Report 2017 shows new insights into these violent conflicts. In 2016/2017, forced migration was one of the main topics of BICC's work, comprising various research projects. BICC's main approach is to look at refugees and their everyday experiences—for instance in camps, on their escape routes or in the course of integration processes. "The perspective of the displaced person is important to us, be it in a refugee camp in Kenya or a refugee shelter in North Rhine-Westphalia", Conrad Schetter, Director for Research at BICC, explains. The annual report also introduces projects that analyze motives, the mobilization and networking of violent actors. To this end, BICC conducted empirical research in Kurdistan–Iraq, Donbass as well as in Afghanistan. "Building on our insights gained from our fieldwork, we develop concrete recommendations for policymakers and practitioners", Schetter stresses. 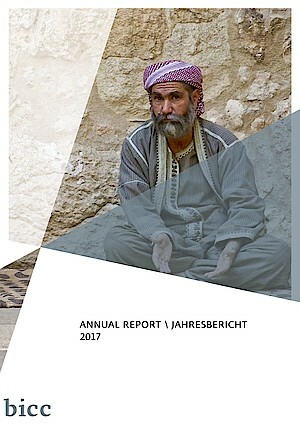 Ultimately, the annual report also presents our research and advisory activities on small arms control. BICC posts staff members to international organizations, such as the African Union and to African regional organizations. "In doing this, we are directly involved in political processes regarding the improvement of small arms control", Schetter points out.